In one’s life there are those meals that are memorable, a revelation really, with the power to bring you back to that moment in time. For me, I am transported to Brussels almost 30 years ago. I was travelling alone in Paris and had decided on a whim to explore a bit of nearby Belgium. No agenda, no reservations. After checking in at my hotel, I headed out to explore the city. After wandering the city for hours I found myself lost in a quaint residential neighborhood, not far from Avenue Louise where many Embassies are located, after darkness had long fallen, famished. I was thinking I should get back to a main street and hail a cab when I came upon a small gem of a restaurant, its amber lighting beckoning me in. I could not believe my luck. Once seated I realized the whole menu was featuring white asparagus. What??? When in Rome….When my dish of steamed asparagus with a soft poached egg in a sublime vinaigrette arrived, I was blown away. Simple but astoundingly delicious. At this point in my life I had only ever had white asparagus from a can, which is not memorable at all. Since then, I have discovered that in some parts of Europe, the white asparagus harvest is celebrated and whole meals in both restaurants and private homes are prepared showcasing white asparagus. When I read Teresa at Food on Fifth’s “An Homage To White Asparagus and Elizabeth” I knew I would make the deep dish white asparagus pie. I searched for weeks for white asparagus but had missed the short spring season in Pennsylvania. 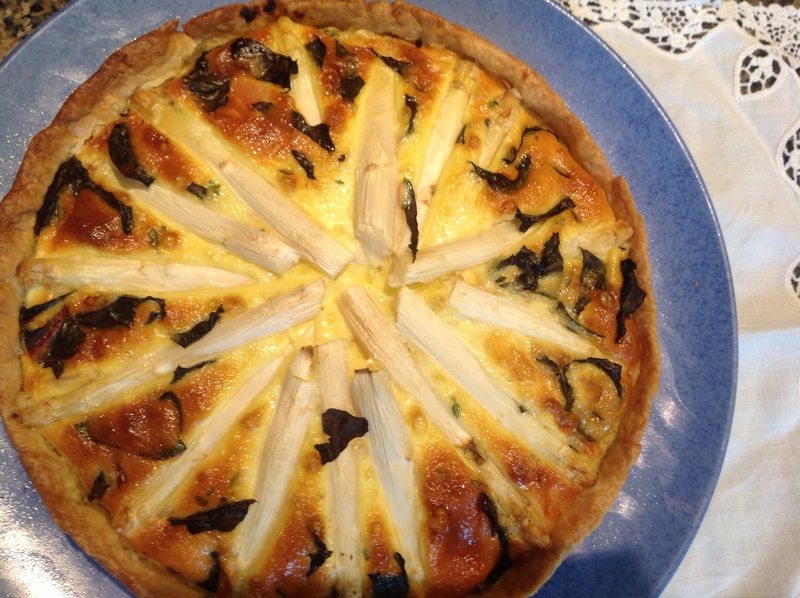 I had resigned myself to making the quiche next spring. But then last week I found ivory hued asparagus from Peru at my local market! I was so surprised and delighted, I started talking to anyone who would listen, to share my excitement. I am sure people thought I was a crazy eccentric. But I knew I had found a treasure and hurried home to make this pie. White asparagus from Peru is not as good as the market-fresh fat spear- asparagus from Europe, but it is better than no white asparagus at all! 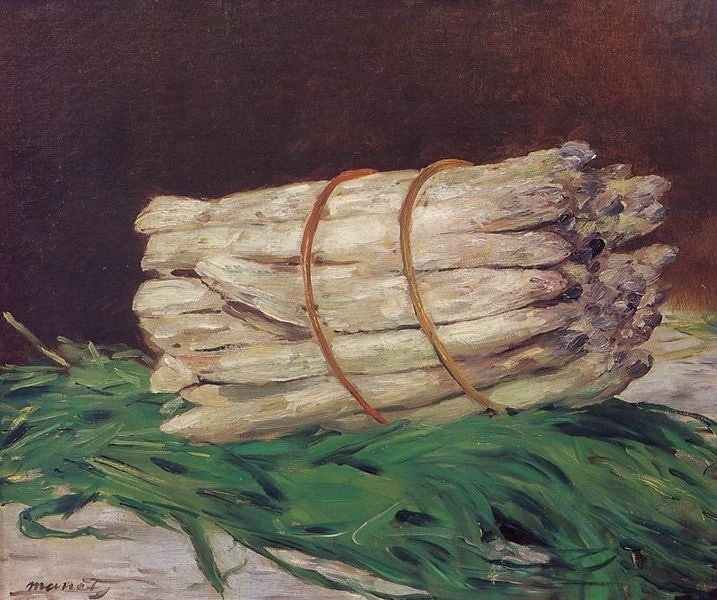 White asparagus has been revered for centuries. 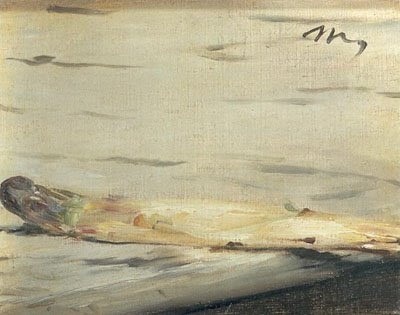 Edouard Manet even immortalized it in 2 famous paintings. 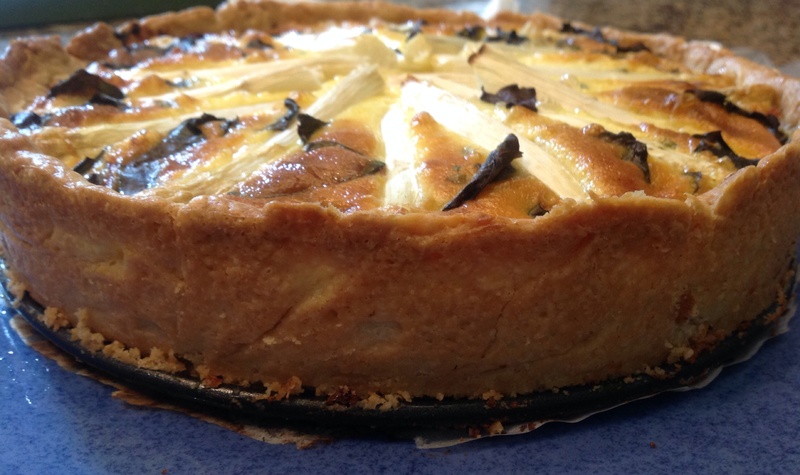 This deep dish quiche is a really delicious homage to white asparagus, which is sweeter than the more common green asparagus. White asparagus is really green asparagus which has been grown without light to prevent photosynthesis and the production of chlorophyll. Its texture and taste is unique and it is prized for its earthy subtle flavor. This dish really lets it take a starring role, which it should! In an 8 inch springform pan, fit your pie crust, extending the pastry up the sides a few inches. 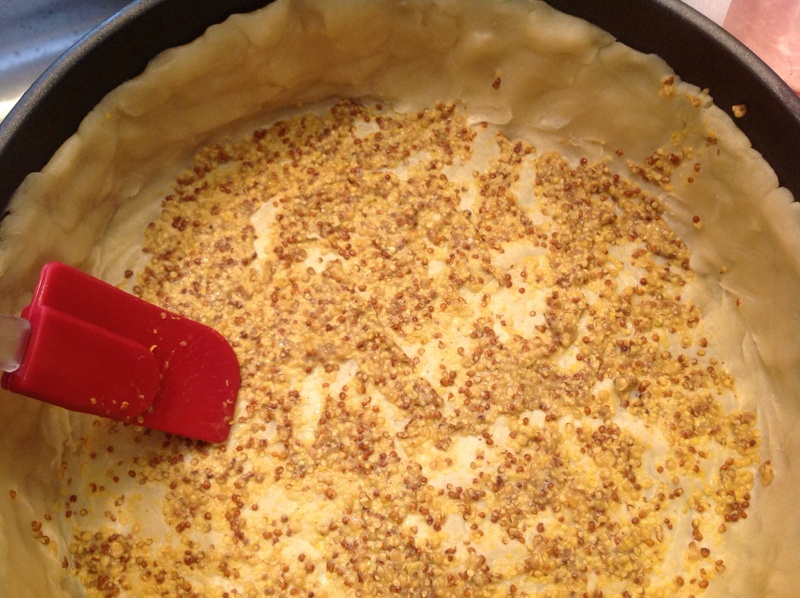 Using a spatula or a pastry brush, coat the bottom of the crust with the mustard. Rinse the asparagus, trim to a 3 inch length from the spear end, and blanch in boiling water for 1 to 2 minutes. Drain and rinse in cold water to stop the cooking. Dry on paper towels. 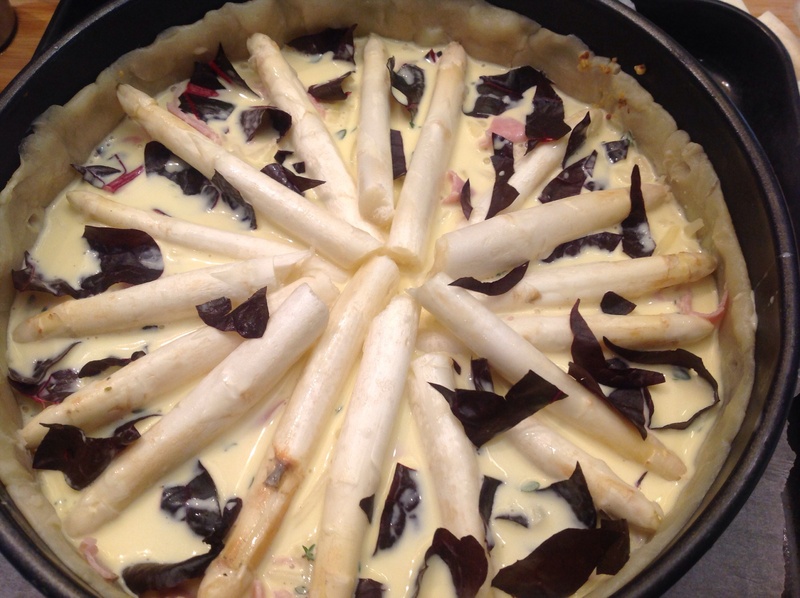 Only the tender tops of the asparagus will be used in our pie. The rest of the stalks can be used later for soup. 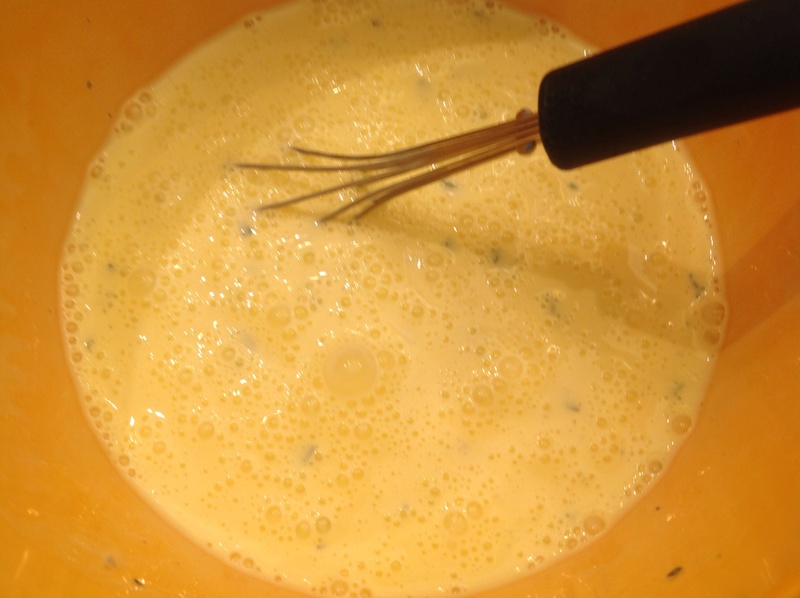 In a medium bowl, whisk together the eggs, cream, thyme and salt and pepper. 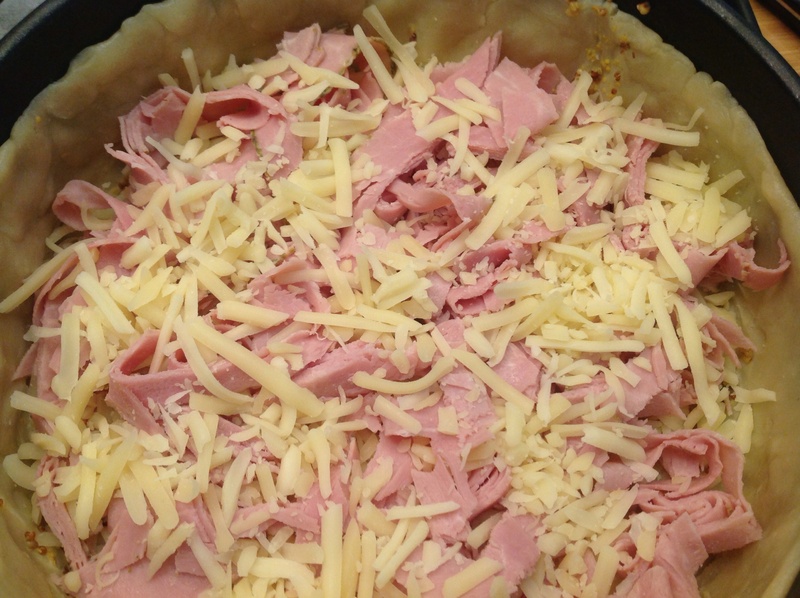 To assemble, spread half the cheese on the mustard-coated crust. 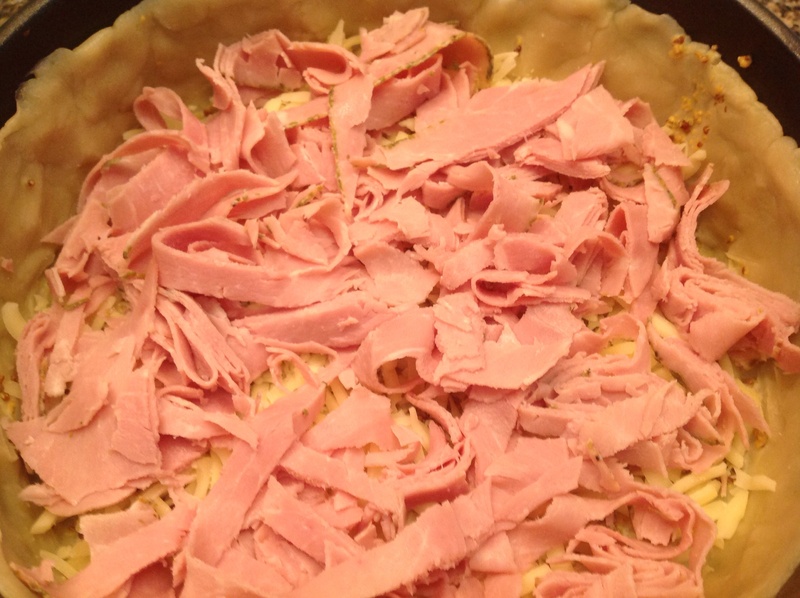 Top with all the chopped ham. 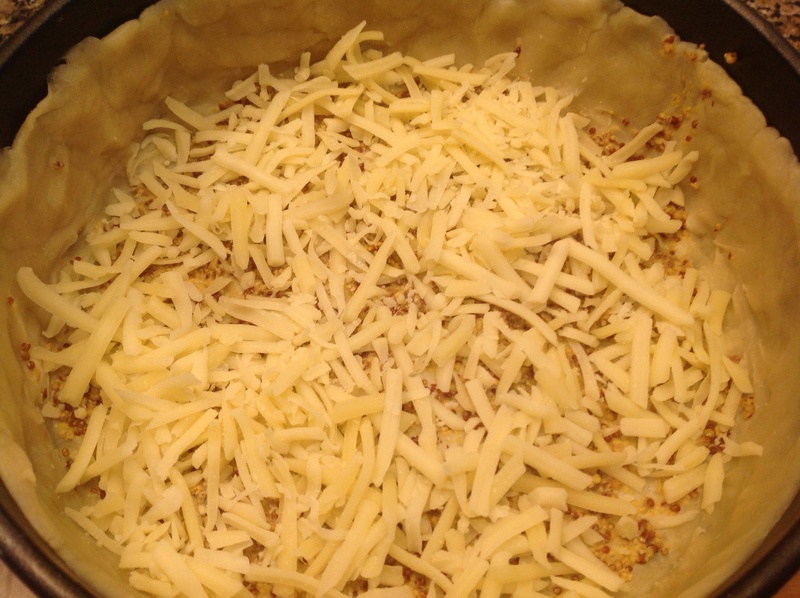 Sprinkle with the rest of the cheese. 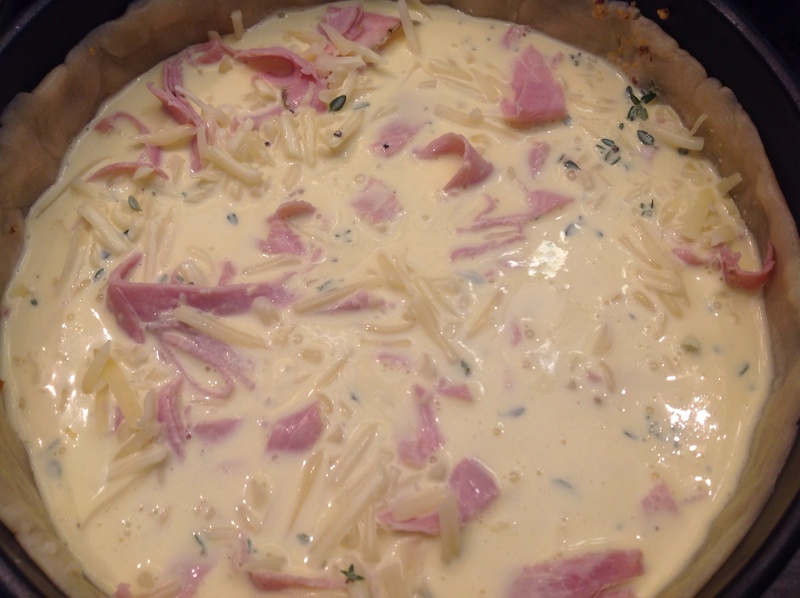 I used a combination of gruyère and swiss cheese. Over fhis, pour the egg-cream mixture, tapping the pan gently to allow the eggs to seep through all layers. 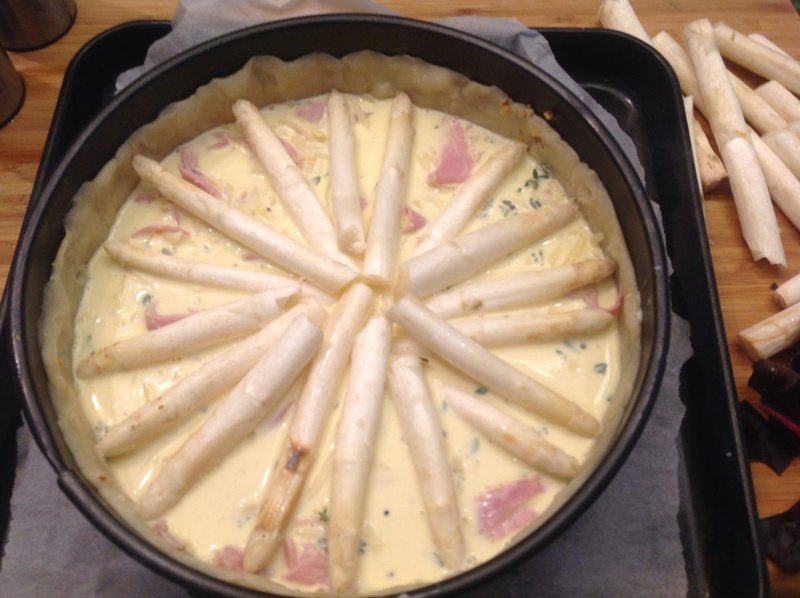 With the asparagus spears pointing towards the outside of the pan, lay the spears in a wheel pattern on top of the pie. If using, scatter your kale leaves randomly across the top. I used torn swiss chard, fresh from the garden, on mine. I felt the greens distracted a bit from the beauty of the asparagus pattern and when making this again, I would layer the greens on top of the ham instead. Place your springform pan on a cookie sheet to catch spills. Bake 40 minutes in the center of the oven. Cool about 10 minutes before running a knife around the edges and removing the sides of the pan. A golden, glorious homage to white asparagus which transported me back to that magical night in Brussels so long ago. What is your most memorable meal? I hope to have transported you back to your memories of a special meal. Thank you for visiting with me and reading my 100th post! 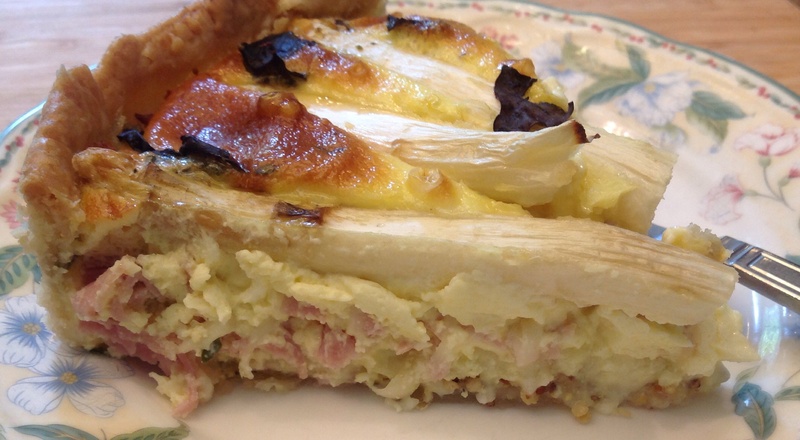 This entry was posted in Recipes and tagged White asparagus and ham quiche by Johanne Lamarche. Bookmark the permalink. I completely understand your appreciation for certain dishes and the wonderful memories they invoke. Mine was (over four decades ago) eating a bean, potato and tomato salad at a student cafeteria in Madrid. It was only the first course of the meal, and probably at that time I had never tasted good quality olive oil – mixed with a generous amount of garlic and fresh vegetables. I still love bean and potato salad for that reason, but still can’t quite match that first experience. 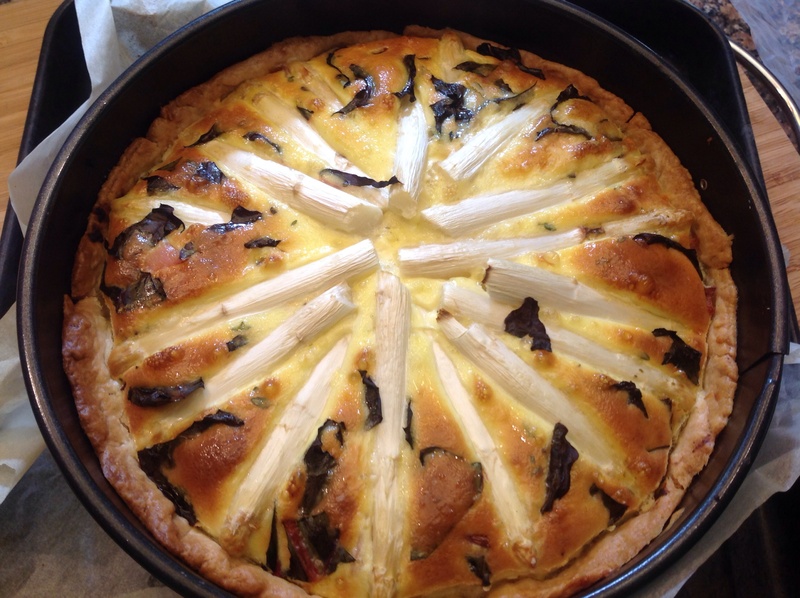 Your quiche looks sublime. I am so happy to be transported to Madrid with you today Hilda! Perhaps we should both return to the scene of our first revalotory food experience and try to recreate it. Might not be possible but oh the fun in searching to discover it again! Thank you for sharing your story. never seen any fresh white asparagus istead the canned one here in Indonesia, definitely gonna try this recipe with green asparagus! Looks amazing! Greetings from Montreal. Thank you Linda! Loved hearing from you in Montréal, one of my favorite cities, where I once lived while attending l’Université de Montréal. Congratulations on your 100th Post!!!! I’ve been inspired by so many of them, two of my very favourites being your “Bird Day Cake” and the “Maribou Wreath”. Your instructions and pictures are so well delivered and easy to follow. It is a pleasure following your Blog and I look forward to continually being inspired by your passions!!! Thank You!!!!! wow! It looks really good! I’d die to try it! Wonderful job! Oooohhhhhh….what a beautiful specimen! That is picture perfect! I’ve never eaten white asparagus. Like you said, it is in the market for about a minute, and then it disappears! I never knew the difference in that and the green asparagus other than the color. Now that I know, I think it would be worth a try. Combined with all the other ingredients in the pie, I can only imagine the cheesy, wonderful goodness of it all! Johanne, congrats on your 100th post. I love to read it and is always fun to look at . Although, growing up in a country and area where white asparagus is a normal, though seasoned (usually from mid April to June 24th) vegetable, I have to say this Peruvian asparagus does not come even close to the taste I am acquainted to. Plus store clerks don’t know how to handle it right. They put it on ice!. That is a total no-no! Besides that white asparagus just grows underground ( compared to the green) the other big difference is, that you have to peel the white asparagus pretty thoroughly, otherwise it is very fibrous.and wouldn’t taste right. Next time I bring some (next spring) I will try to get you some to taste! Thanks for that information, Helga! I know YOU know white asparagus!!!! I would love to taste the real thing again. As I said it was so delicious, I still remember it 30 yrs later. When you host the German association’s festival of asparagus dinner I will try to come. Is that asparagus imported from Germany? How long is the season in Germany? Do they have a fall harvest as well? Let me know your favorite way to prepare it too! Thanks for reading Helga! Johanne, the season really is only from mid April to the June 24th (midsummer). No fall or second harvest. Rather short, but very delicious if you happen to live in Germany! We, specially, my husband, often try to go in the spring to Germany to consume as much as we can while there. Besides farm markets and supermarket, there are a lot of farmers who sell the asparagus directly from the farm. Get’s no better than that! Funny enough, we found out that you can bring fresh white asparagus into this country, but only the white one not the green! To tell you the truth, we really like it simple prepared: naturally cooked,with a Hollandaise, fresh young potatoes and a slice or two of fresh cooked ham. Yummy!!! You definitely will get an invite next time we have German imported Spargel at the house. I can’t wait Helga! Thanks!!!! You are an amazing woman . . . always an inspiration! Congratulations! 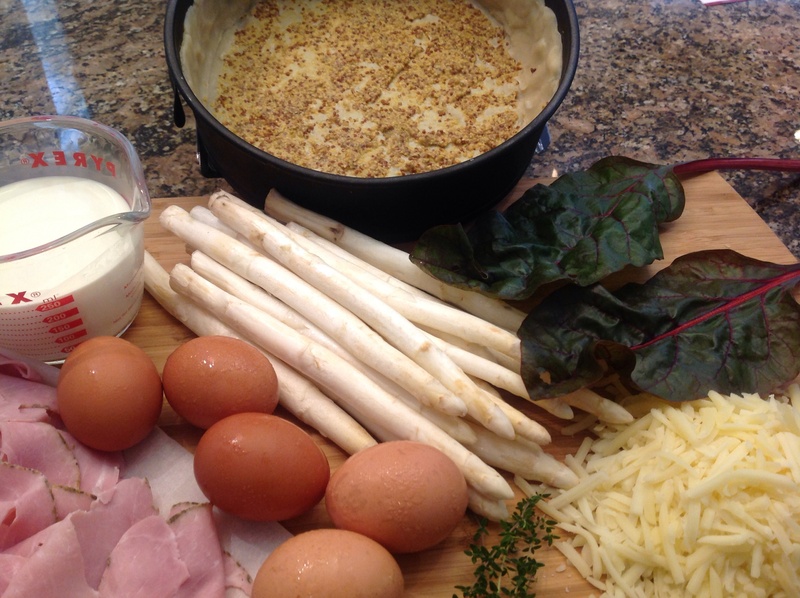 Anxious to try this recipe the next time I come across white asparagus. Exciting news! Let me know how it turns out!!!! !